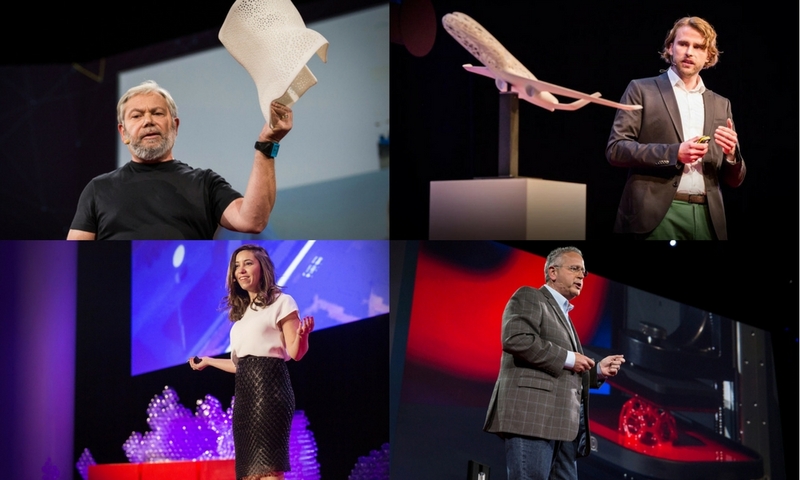 TED Talks about 3D Printing: The TOP 9 you should see. As you know, TED Talks became a forum that presents all kind of ideas regarding the innovations and technologies, sharing experiences or knowledge and news about the past, present, and future. As a cutting-edge technology, topics about 3D printing have been around and obviously presented by some of the experts in 3D Printing. Learning is easier by watching, so we combine the best 9 TED Talks that makes you see 3D printing in different sides and what kind of revolutions this technology may bring in the next future years. “3D Printing is actually a misnomer. It’s actually 2D Printing over and over again.” said the CEO and Co-Founder of CLIP Resin company. In this 10 minutes conference, he explains how Time and Duration are crucial when it comes to 3D printing. As he demonstrates the 3D printing process live in front of the audience, he then explains how the CLIP technology can print up to 25 to 100 times faster than a traditional 3D printer. A must see TED Talk on 3D printing, very inspiring. Also, it is fascinating to see how fast the CLIP process is! During this conference with Avi Reichental, you will enter the world where you realize that 3D printing is truly a game changing technology. He explains that 3D printing can change your everyday life, bringing many opportunities from any 3D materials. From 3D printed glasses to a 3D printed suit to help a paralyzed person be able to walk again, to custom-made parts used in the medical industry, to aeronautic 3D parts engines that can save more fuel, the CEO of 3D Systems will make you realize that 3D printing is real! In this TED Talk conference, this Israeli designer describes her experiments regarding the creation of 3D printed clothes. From the first 3D printed skirt that she designed and 3D printed overnight, she then started to learn more about this layer by layer technology by discovering new materials and different 3D printers. Discover her story, how 3D printing offers many possibilities that allowed her to launch her own fashion brand. Lee Cronin, a chemist at the University of Glasgow talks about how 3D printing enables you to create customized drugs. The future of medicine is to allow people to print their own homemade medicine. He explains that they would go to an online drugstore with their digital prescription, then buy the blueprint and chemical ink that are needed and then print the medicine at home. In the conference with Surgeon Anthony Atala, he describes his experiments that could solve the organ-donor issues using an Inkjet 3D printer that uses living cells to output a transplantable kidney. Moreover, Dr. Atala’s young patient, Luke Massella who received an engineered bladder 10 years ago is on stage during this conference to tell you how 3D printing gave him hope in life. The medical industry is always an interesting field where researchers never cease to create 3D printed objects that will amaze you. Refer to our blogpost “How 3D Printing Impacts the Medical Industry”. Working at Airbus, Bastian Schaefer and his team want to build a more sustainable future of aviation inspired by a bone and a skeleton design. In this TED talk, he speaks of the future of the aerospace industry using the 3D printing technology to manufacture components and to build a plane according to the world’s need, from a different seat which adapts to the future passengers to the social area where you can play a virtual golf inside an aircraft. Read our blogpost about “3D printing takes off with aeronautics & aerospace” to discover more about how 3D printing revolutionizes this industry. 3D Printing has been around for more than 30 years but it is being used broadly only now. Following the growth of this layer-by-layer technology, the 3D printing entrepreneur explains the needs to train people in 3D printing as she believes that this technology “cause a revolution in manufacturing.” Lisa Harouni gives a very useful information about what exactly additive manufacturing or 3D printing is and how it works. Shelter is the topic of this TED Talk. Nearly one billion of people around the world are living in a poor shelter condition. To help find a solution, Behrokh Khoshnevis, who is also a Director of Manufacturing Engineering Graduate Program at the University of Southern California introduces the process named “Contour Crafting”. Watch this 12 minutes TED Talk to learn more about 3D printing in the construction industry. For our French Speaker readers, here is also a special TED talk from our UX designer Alex Gryson that will enrich your knowledge of 3D Printing. Learn more about additive manufacturing thanks to Alex Gryson. There you have the 9 must-see TED Talks on 3D Printing which I hope you will get so many inspirations from it. But this time is your turn to create your own 3D printing story. With Sculpteo’s online 3D printing service, it’s easy and fast. Start by uploading your 3D file here.